Marshmallows & “Marleyisms” | "Marley, stop..."
A few moments ago, I was rocking Marley & Killian in the recliner. I had just nursed Killian to sleep and was enjoying some Marley snuggles before hopping up to make us a snack. 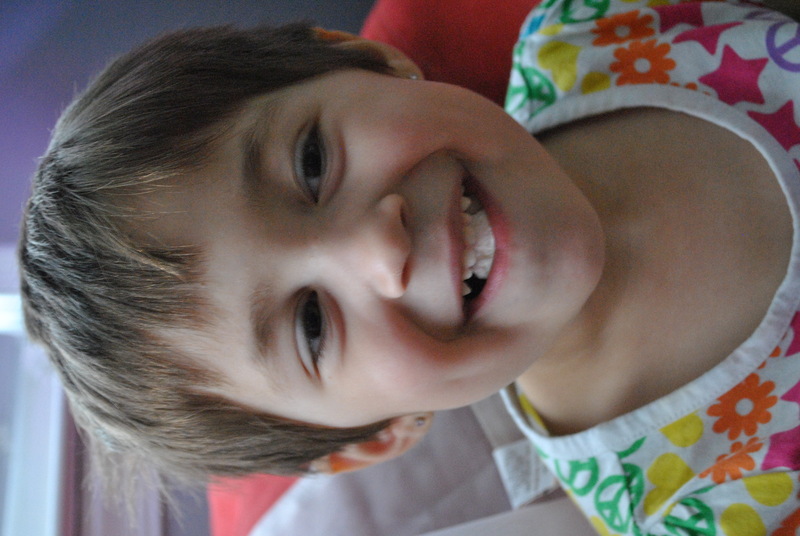 “Mommy– do you hear that SOUND!?”. When I told her that I didn’t, she explained further “it’s kind of a… plunky sound”. “Nope.. I’m sorry, I don’t hear it.” I stopped rocking & tried to listen past the Doodlebops on tv. I nearly woke Killian up laughing!!! It turns out she was hearing a ride on toy that I had under my foot as it slid 2 inches back & forth on the floor as I rocked. It was the quietest sound, but that’s pretty typical for Mo, lol! I remembered a small egg crate decoration I picked up at our local craft store this Spring but never did use. It has 9 cavities and is meant to hold small treats/baked goods. I placed a jumbo marshmallow into each spot and then grabbed food color markers from my cake pantry. I placed pink O’s & purple X’s on them and brought them out to Marley. 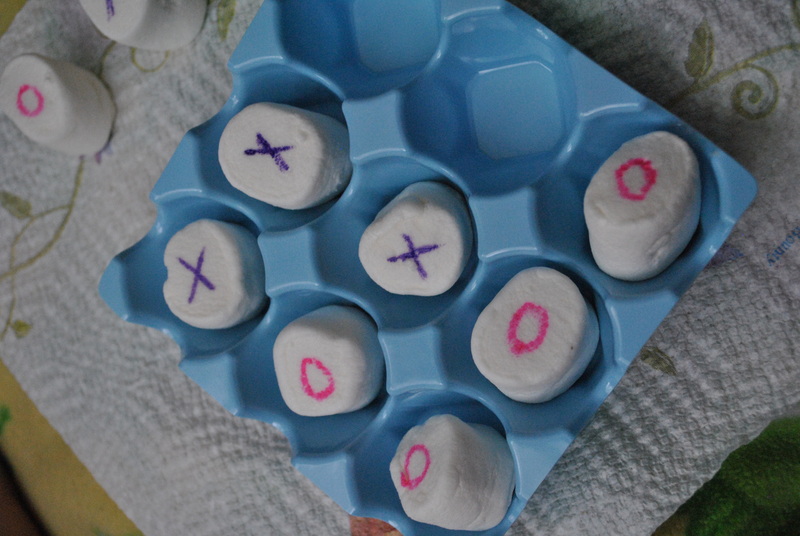 I explained Tic-Tac-Toe and she chose to be the pink O’s. 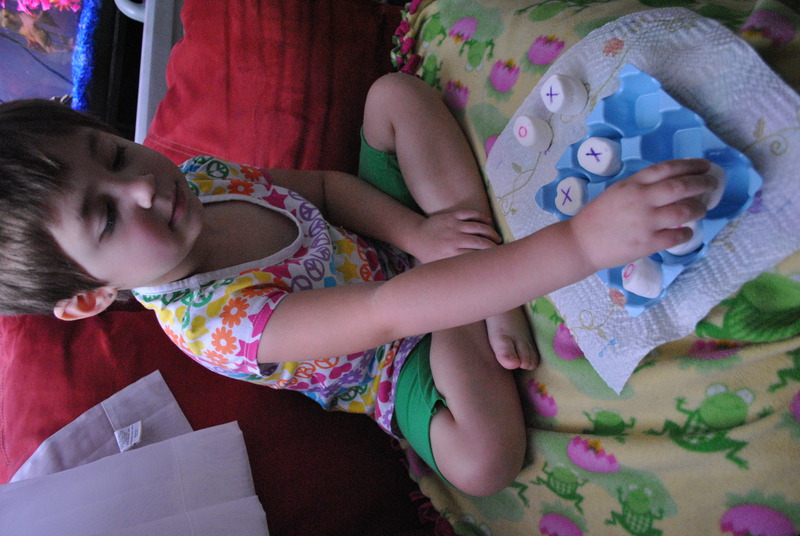 We played one round and as she ate them we talked about ‘same’ & ‘different’ comparing the marshmallows with the O’s to those with the X’s. 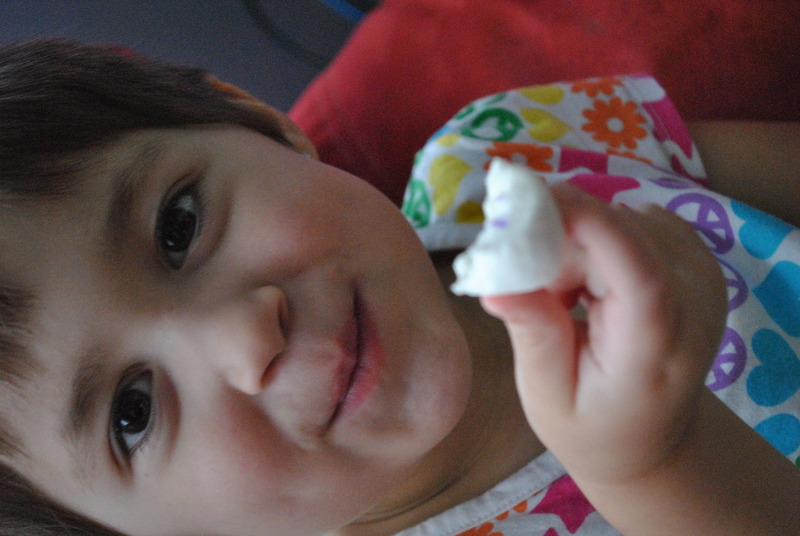 She’s now ripping the napkin to bits and talking me through a game of ‘buy my (imaginary) candy out of this thing’, lol! 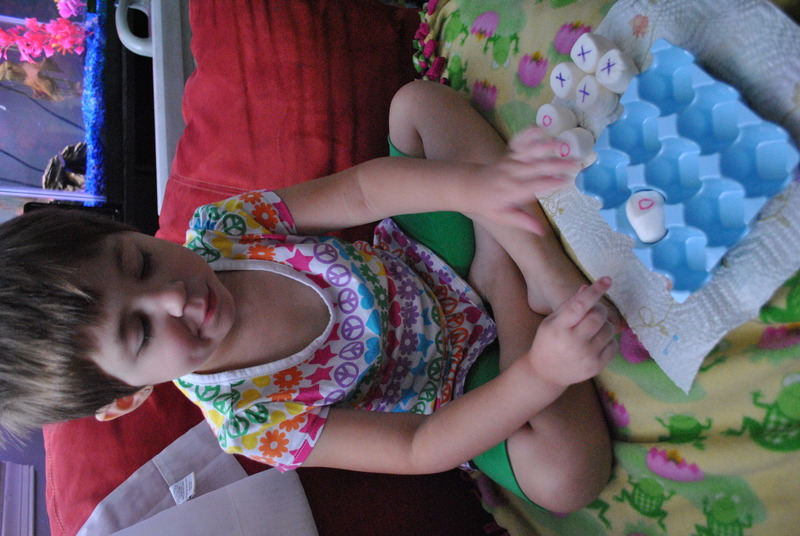 The 'Tic' in her Tic-Tac-Toe! "The name of the game is 'i win'!" Posted in Aspergers, Fun with Food, Marleyisms, SPD. Bookmark the permalink. That is super creative! Love it ❤ And hahha I love her sharp teeth!